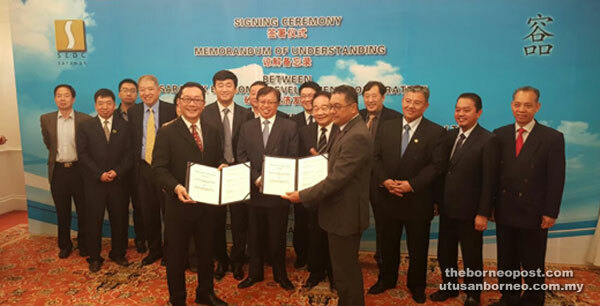 Abang Johari (eighth right) witnessing the exchange of MoU documents between SEDC and Beijing Glory as (from right) Penguang, Aziz Hussain, Morshidi and Wong (sixth right) look on. BEIJING: Chief Minister Datuk Amar Abang Johari Tun Openg made his first visit to China on Sunday since his appointment as chief minister two months ago. Yesterday, he witnessed the signing of memorandum of understanding (MoU) between Sarawak Economic Development Corporation (SEDC) and an international Chinese tourism development company, Beijing Glory International Culture Development Co Ltd (Beijing Glory), at Nou Hotel here. The MoU is to further develop Sarawak’s tourism potentials and hospitality management. China Express Airline will make Kuching as its South East Asia hub; Beijing Glory shall manage two SEDC hotels – Damai Puri and Grand Margherita – in Kuching; there will be increasing connectivity for Chinese, Korean and Japanese tourism markets; Beijing Glory will take over management of some tourism destinations such as Bako and Mulu National Park; there will be rebranding of SEDC’s Sarawak Plaza. The new chairman of SEDC Tan Sri Datuk Amar Aziz Hussain and its general manager Datu Soedirman Aini signed for SEDC.Abang Johari was accompanied by his wife Datin Amar Datuk Juma’ani Tuanku Bujang. Second Finance Minister Dato Sri Wong Soon Koh and State Secretary Tan Sri Datuk Amar Mohamad Morshidi Abdul Ghani as well as their spouses were among those in the delegation. Also accompanying Abang Johari were Assistant Minister for Local Government Datu Penguang Manggil and senior officers of the Tourism Ministry. Later yesterday, the delegation flew to Kunming City as part of the itinerary for the weeklong visit, and thereafter to Hong Kong and Guangzhou.